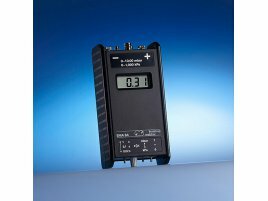 The EMA 84 is a portable, battery-powered digital pressure gauge providing highly accurate measurements of positive and negative differential pressures. Because it is durable and easy-to-use, the EMA 84 lends itself well to maintenance work and customer service applications for heating, air-conditioning and ventilation units, where it can be used for monitoring filters, measuring fireplace drafts, etc. Its precision and reproducibility also make the EMA 84 is highly suitable for use in laboratory applications.